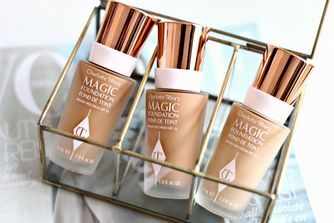 Multi-award-winning, Charlotte Tilbury's otherworldly Magic Foundation was five years in the making - combining phenomenal skin care benefits with ultra-long-wear, buildable coverage - to leave skin looking flawless while working to control oil, diminish depth of wrinkles and protect from everyday environmental stress. It's the 'Holy Grail' base for modern urbanites. 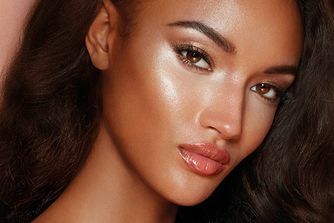 This hard-working full coverage foundation is brimming with skin-loving ingredients to actively correct as it perfects. Cloaking skin with a featherweight, semi-matte veil, this formula infuses cells with precious moisture to diminish depth of lines and grant a gorgeous, dewy plumpness thanks to 'hyaluronic filling spheres'. With firming and 'tightening' mushroom extract, alongside antioxidant vitamin C this increases resilience to deflect everyday environmental stress, while broad spectrum SPF 15 protects skin from the damaging effects of UVA/B rays. Ideal for all skin types - including oily or acneic (it boasts oil-regulatory technology) - your complexion will look completely flawless all day long. Shake well and squeeze a small amount of foundation onto the back of your hand. Apply using a foundation brush or your finger tips. For the day, blend it into your skin from the middle outwards. The SPF15 will protect your skin from photo-ageing. For the evening, carry out the same application but pat onto areas where you need extra coverage, to achieve a flawless semi-matte finish. Aqua/Water/Eau, Cyclopentasiloxane, Cyclohexasiloxane, Talc, Cetyl Peg/Ppg-10/1 Dimethicone, Titanium Dioxide (Nano), Glycerin, Nylon-12, Hdi/Trimethylol Hexyllactone Crosspolymer, Zinc Oxide, Acrylates/Dimethicone Copolymer, Phenoxyethanol, Benzyl Alcohol, Sodium Chloride,Magnesium Sulfate, Hydrogen Dimethicone, Sodium Dehydroacetate, Alumina, Disteardimonium Hectorite, Dehydroacetic Acid, Potassium Sorbate, Benzoic Acid, Dimethicone, Tetrasodium Edta, Tocopheryl Acetate, Aluminum Hydroxide, Triethoxycaprylylsilane, Ascorbyl Tetraisopalmitate, Propylene Carbonate, Sodium Hyaluronate, Butylene Glycol, Silica, Ethylhexylglycerin, Fomes Officinalis (Mushroom) Extract, Peg-40 Hydrogenated Castor Oil, [May Contain/Peut Contenir (+/-): Titanium Dioxide (CI 77891), Iron Oxides (CI 77491, CI 77492, CI 77499)]. I REALLY wanted to love this foundation. The lipsticks from this makeup designer are gorgeous - luscious and long lasting. However, this foundation did nothing for my face except draw attention to large pores, and the broken capillary I was trying to cover up. Despite the colour match and the feel of the foundation on my skin being perfect, the coverage is way too light to call this product magic foundation. Such a pity, because the Magic night cream, the primer and the other products I have tried are excellent. I’ve searched for ages for a foundation that suits my skin and actually lasts and I’ve finally found it! My skin looks so healthy and glowy love it! The foundation is lovely, provides a nice light.natural coverage whilst keeping skin looking like skin. I've found its also helped clear my skin as well. The only thing I would say is that you need to use quite a bit to cover your face, its not a one pump job, its a 3 maybe 4 pumps. Which is not ideal when your paying over £30 for it. My favourite foundation to wear for everyday wear. Build-able coverage, also best skin match for my light/ medium Asian skin tone. Love CT products. In my long-term research I have heard this very well. I loved it! I have a very light skin tone and it is not always easy to have the right color. I hit the color full! I love color, texture and durability! 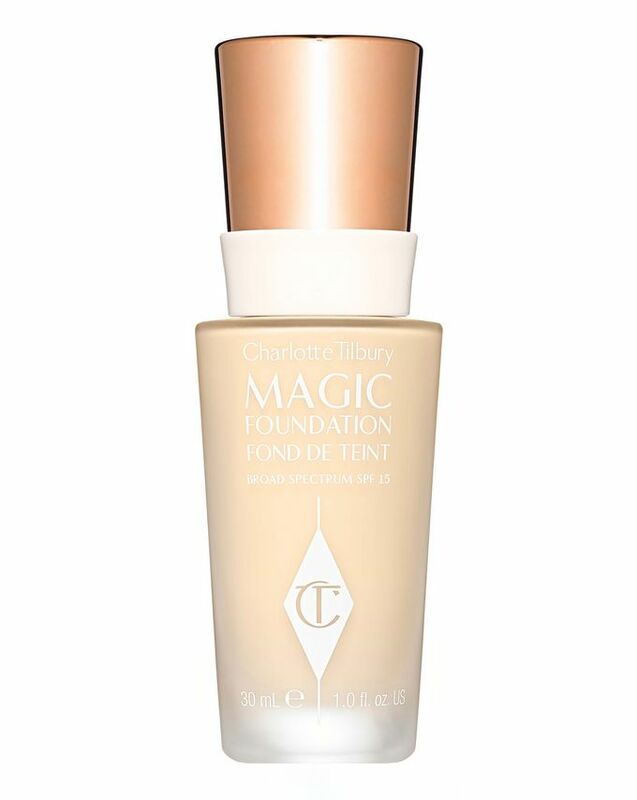 I find the foundation just wonderful, it applies nicely and stays on all day. I have very oily skin, and I have to say that with this foundation I am staying shine-free for longer. I use it in combination with the wonder cream, and I love both products. When I first bought this foundation a few years ago, I was converted to it. I loved how there was a selection of shades, it (generally) stayed put on my oily skin and offered great coverage. I recently repurchased it but I am now rather disappointed by it. It doesn't apply well with a brush, a sponge is necessary. I've also been told when I wear this foundation it's very obvious! If you're looking for a Charlotte Tilbury product to invest in, I would recommend a lipstick or an eye shadow palette as opposed to this. Very average foundation. Thick consistency, looks greasy and doesn't last. Good range of colours, but none quite suited my skin tone. Good for heavier coverage but if you have a tendency towards oiliness I really wouldn't choose this. I purchased a shade 8 which is labelled as medium when first applied it was a match for me however it turned orange also it gives you flashback due to the SPF it broke apart around my nose during the day the only good thing is the coverage when freshly applied save your money. I love this foundation! I usually avoid foundation at all costs because I hate the feeling of it on my face, and I've personally never felt a massive need for it. I particularly hate wearing foundation over the summer because I find my skin always feels like it's bubbling when it gets really hot. However, this product has been the perfect solution. I just put a few dollops on my face and blend it in, which results in my face having a lovely smooth texture and healthy glow. Also I am a fan of the fact that it has SPF 15 which is a massive bonus...and the packaging is beautiful! I think if you want loads of coverage, this product doesn't seem great based on the reviews I've seen on here and online, but it's perfect if you're looking to give your skin a smooth appearance and healthy glow! I have gifted this foundation which made me very excited the shade was perfect. BUT the finishing of this foundation I actually believe is very unnatural, it is obvious that you are wearing foundation. it is quite dry and products do not blend well together. I tried it to give it a number of times a chance but it keeps disappointing me. It is not worth the money and it does not look good on the skin. I have really tried to get into using this foundation, however, I always seem to be looking for a different foundation. Good coverage for the first few hours. It is quite drying and after a few hours it wears off. Quite an ordinary foundation. The only plus is that it's light enough for my skin. I've tried different styles of application, and it still looks weird on the skin and is quite visible in the pores and fine lines. I bought this foundation after a makeup artist recommended it to me and I have to say it was the right choice for my requirements. It goes on smoothly over most primers and stays matte for upto 5 hours on my combination skin. One recommendation though - use it with a makeup brush and not a sponge. So many negative comments about this foundation, but I have found it to be excellent. I gave it a 4/5 because it does need to be built up to achieve maximum coverage, but that aside, I find it creamy, easy to apply and has a great range of shades to suit most skin tones. I am a fifty seven year old woman who has a normal to dry skin. This foundation suits that combo best and its worth noting that it works really well with after using an excellent exfoliator and moisturiser. If you have patchy, flaky dry skin, then this will not work for you but on my dry(ish) mature skin, its provided excellent hydration, a porcelain finish and perfect 8 hour plus longevity. Ok, I tried to apply it with Magic cream and Wonderglow and finally IT WORKS! It doesn’t crease anymore!!! And powder works perfect with this combo! So it’s 4 out of 5! Well, I couldn’t wait for my order to come so I finally could try this magic on my skin...but magic didn’t happened. The foundation was creasing around the nose, on my cheeks and sink into my large pores. First I thought I’m doing something wrong. I tried different combinations with primers, moisturisers but it was still creasing. And the sad thing was that when I put a CT powder it looked so horrible. I was hoping to love it but this foundation is not for me. I have always be devoted to my regular foundations but thought I'd branch out. This blew my mind away. Perfect shade match based on their photos and gives a fab dewy finish. This foundation would probably suit oily to combination skins. As for me who has dry skin, it shows dry patches and worst flakiness of my skin. It's not full coverage but medium. I had seen this all over youtube so I thought I'd give it a try and I loved it. Although it's probably medium coverage, not full (so for acne sufferers like myself, concealer is needed) it's also a really nice demi-matte finish so it's not dewy but it's not matte either and looks natural. I got the colour 2 but I think I'll get the colour 1 this time because it can run a little on the warmer side. Definitely for anyone who has combination skin - this didn't break me out at all. Purchased this foundation before it was available on Cult Beauty from her flagship store in Covent Garden. Although this claims to be 'magic' I found that it was far from it. I had high expectations for this foundation. I knew it wouldn't be full coverage as Charlotte's products focus on emphasising what you have using ingredients that are good for your skin. However this compromises the overall finish of the product. Definitely not for those who want a full coverage flawless finish. This foundation will leave you with oily and patchy skin and it will settle into all of your fine lines and wrinkles whilst emphasising your pores. So, I was so eager to try this that I paid extra for quick delivery. It arrived 30 mins ago and I purposely left my make up in the morning until it had arrived. I bought the medium 6 shade which was a good match for my skin tone, but this really is awful foundation for the price. I applied my normal primer, and I normally use my beauty blender so went on to use this, to find there was virtually no coverage at all. I then thought maybe it's the sponge so used my artist brush. Still barely any coverage. I got through 4 different applicators and came to the conclusion it was the foundation. It claims to have full coverage, but it is barely medium coverage. So disappointed. Unless you have brilliant skin and don't actually need foundation on and wish to waste £30 for fun, then buy this. Had a slightly lighter coverage than I expected but loved the finish it gave and it lasts throughout the day. The consistency is great, don't get me wrong and because I have dry-combination skin it felt really lovely on my skin. But after a couple of uses I noticed it gives me a slight tingling sensation. Also, the product is no where near as full coverage as I like and not easily buildable. I have yet to try it mixed with other foundations so I hope that will improve the coverage, also would prefer if it was more dewy, it seemed a bit dull on my skin. I have been using Mac Pro long wear for years now so I thought I'd give this foundation a try as I've heard great things about it. The first day I wore this product my skin became so oily and my foundation was just coming off and going patchy. I don't usually get oily skin but with this product I did and I found after a few days of using it I started to come out with spots which I rarely get. So this really wasn't for me. Think I'll be sticking to my trusted mac prolong wear. I absolutely love this foundation; medium coverage, light and amazingly - the lightest shade actually works for me! I am super pale & have struggled a lot to find the right colour. I've been using with Gosh hydrating primer perfectly, despite having dry skin. Love that it's matte finish, easily made less so by using a beauty blender to add a really thin layer of primer over the TOP - try it some time if you have dry skin. I just purchased my second bottle of it. It's hydrating and have a nice finish. I love how it wears. However, not so full-coverage as I expected. I so wanted this foundation to work for me but sadly it doesn't. I have combination skin and it makes my skin greasy. I have used benefit's primer underneath and powder on top, still after an hour or so it just look patchy and oily. I was surprised it was a medium coverage (I thought it was a full coverage foundation) and of course i can't build it up because i would look like I'm sweating after 10 min. The lightest colour is perfect on me, which is such a shame, because I have trouble finding a perfect match. It will probably work for someone that has dry or normal skin. It's a nice medium coverage...but didn't minimised pores..anyway superb!!! No make up make feeling with skin like finish. I have an oily/combo skin that's acne prone and with first signs of very fine lines. I have this foundation in shade 3 (literally perfect match) and so far so good. I do use primer (high adherence one), then powdered the face with some translucent powder and after about 8h of wear, it has not (luckily!) separated or gathered in my fine lines. Yes it has rubbed off in places (nose and chin but I do blow my nose a lot due to allergies), but the rest seems to have held off very well. I just used a blotting paper and its all good. It's a matte finish and medium to high coverage (not full full coverage). I do prefer more natural finish for the day. Overall, I do like it but need more time to love it. it doesn't dry out my skin so that's great (can happen with matte, higher coverage foundations). I think with time it might be one of my favourites but it does have a lot to live up to. Perfect. It doesn't dry my skin out, and it is really natural looking. The best foundation I've used so far! Let's talk about my skin, I have dry to combination skin. I also have a lot of acne scars and redness because my skin is prone to allergy. I've tried TONS foundations, they more or less gave me breakouts. 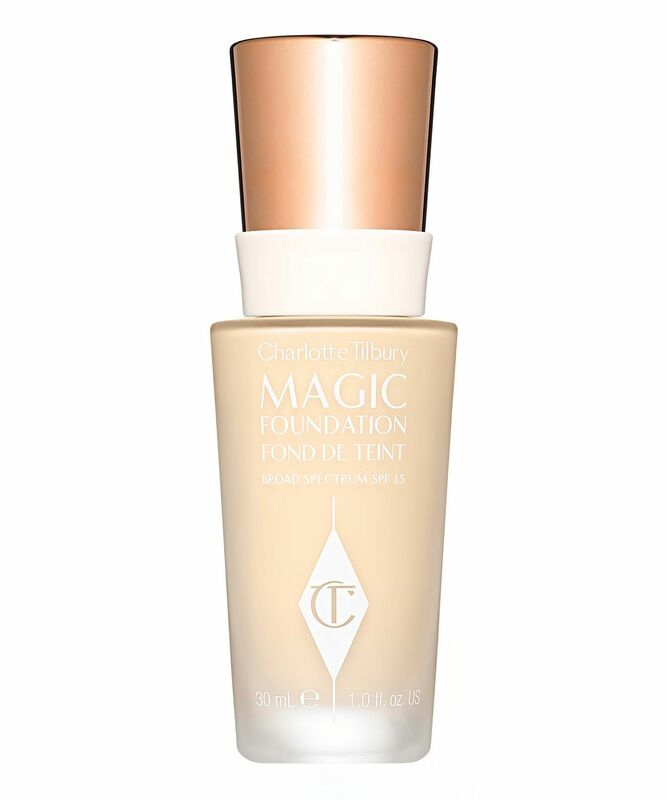 I'd say this Magic foundation is the first foundation that doesn't give me any breakouts. However, I wish that this foundation has more coverage...It can cover my redness but not scars. As soon as I put this on I was blown away by its texture, feel and finish. The coverage is not full but its just right for my taste and needs and I feel like you could easily build it up. it feels like you are wearing nothing on your face and it looks like your skin ...just better. I use it with the hollywood flawless filter under and on top of it. this makes it look even more natural and radiant. I could have purchased an even lighter shade (I got 3) but its still working. I figured it would be lighter from looking at the model that wears shade 3. I would totally recommend and buy again. I have used this foundation for a hot minute now and I still LOVE it! I used to use it on it's own and then switched to hourglass vanish stick, both was running out just before a trip to Barcelona so I mixed them to get me through and WOW. I now do a few light spots of the vanish stick and brush it all over my face then a light coat of magic foundation again with a brush and then use a Beauty blender to take off excess...dream duo...and I cannot go without. I must say have had this foundation for a while but never use it. The shade range is good especially for very pale skin tones and it looks nice when put on at first, but the staying power is too bad that I never bother. It only lasts a couple of hours on my skin before it starts to separate and cake which is very disappointing for the price. Also, it really doesn't work well with the 'Magic complexion brush', I would steer clear of this foundation if I'm honest. This is one of the best foundations I have ever used. Its got great coverage in just one pump and lasts ages. Doesn’t feel heavy at all and the range of shades is fab. It’s a great fail-safe and one to always keep handy! Such a poor foundation, stay away from it. It doesn’t work well with a brush but if you try and use this with a Beautyblender it goes patchy and hideous one of the worst foundations I’ve ever tried. Really wasn't happy with this foundation. I found that even if I touched my face the foundation would come off. By mid-day, I was left with patches all over my face as this foundation really does not last. Disappointing and such a waste of money. This foundation destroyed my foundation brush, I COULD NOT get the makeup out of it and had to buy a new one after a couple of uses with this. I struggled so much getting it off my face at the end of the day that my skin broke out very very badly. HOWEVER. I've never had another foundation stay put all day long like this one when I got home from work it still looked freshly applied, even in m oily T zone. I'm still on the fence about this foundation. I absolutely love the shade as it matches my skin tone perfectly, which believe me is a task! 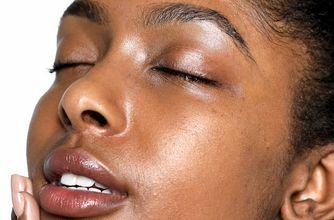 However, I find it quite drying, especially on my forehead and at the tip of my nose and after a few hours, you can see dry skin appearing and the makeup sitting in my eye creases. The shade and texture are absolutely perfect. Works best in combination with other CT-products (magic cream, primer, powder). I’ve had this foundation for a while and when I first tried it I really didn’t like it. However, I tried it again recently with wonder glow and it suddenly looks amazing. I have dry skin and it makes it look flawless and lasts all day. Very happy because it’s one of two foundations I’ve found that is the right colour for my skin. I thought this made your skin look oily and slipped off your face within a few hours, I didn't like it at all. The colour match on this was perfect, I liked the look of it and the bottle is lovely, but that’s all I like. I have dry skin and usually keep it under control but with this foundation it’s like I shouldn’t have bothered. It shows all the dry patches (or makes them where it was fine) and creases awfully. I’m better off wearing no foundation at all. This might be good for those with more oily completions but not for us with dry skin. Treated myself to this foundation, i'm shade 5. Colour match was perfect and that is why it receives 1*. My skin is dry-combo. This foundation emphasises flakes, creases and any imperfections. Felt it was quite thick actually and felt it on my skin through the day. I just couldn't wait to get home and wash my face. Quite drying too. I tried to love this foundation because of the price I paid for it, but no matter what I tried, it just wouldn't work for me. People work hard for their money, there is no reason this foundation should be as much as it is when, in my opinion, it is cheaper drugstore quality. This is my go to foundation if I'm going out for dinner or an evening out. The coverage is amazing on my skin and I find it really easy to blend. Slightly drying personally on my skin (my skin is very dry regardless) however with a good moisturiser beforehand, it never fails. I'd recommend. There are days when I think this foundation looks great on my skin but there are also other days when I think its horrible. First of all, I got the shade 3.5. On the website it claims to have a yellow undertone; nope, I disagree. It looked almost pink on me. Second of all, don't bother applying this foundation with a Beautyblender, it just won't work. For some reason it worked better with a foundation brush. Thirdly, it is not full coverage like it claimed to be. It is actually a light to medium coverage foundation. You want full, go for THREE pumps of this thing. Lastly, I gave it three stars becuase the finish on my skin isn't actually all that bad. Its just that I've tried better foundations out there. Was an excellent colour match for my skin but the positives stop there; made my skin appear flaky, seemed to emphasise pores and wouldn't recommend for oily skin as there was no oil control whatsoever. Waste of £30 do not recommend. For the money, it is not worth it. It's a nice consistency with a nice colour match, but the staying power and the coverage is just not there, especially when it claims to be. For the money, look elsewhere. I have bought a few things from CT, and have always come away disappointed. Probably won't buy again. I bought this foundation hoping that, especially for the price, it would do everything it claims. This foundation goes into fine lines very easily and you can feel it sat on your skin the whole day, making it feel uncomfortable. It really emphasises pores and I couldn't wait to take it off. I tried to mix it with other foundations to see if it would be better and it didn't make much difference, don't waste your money. I have purchased this foundation several times. It is seriously amazing, especially for oily skin. I honestly have the worlds oiliest skin and huge pores it's horrific, but this makes my skin look perfect. It's a full coverage, but not at all heavy on the skin. However, I'm not sure how well it would suit dry skin as it is not a hydrating foundation at all. Being a makeup artist, I use this on all clients with oily skin with a mattifying primer it's perfection! This foundation is not full coverage as claimed. However, it is still a great foundation. I have combo skin, and this gives a nice semi-matte and very natural finish. It last decently throughout a long day (taken my sometimes quite oily t-zone into account). I got it in the shade 3,5 and it has such a nice yellow undertone, which I find is rather rare within some foundation ranges. Really am liking it. I have dry to normal skin and a very red skin tone and this foundation works amazing, It also does exactly what it says on the tin and it STAYS ON! You will need makeup wipes to get it off I can have a shower and go swimming and it stays in place. One pump does by whole face and it covers and evens out my skin tone really well. The lightest shade is still a little dark for me so I use a foundation base that's white to get it lighter but it blends out really well. Get this! I was waiting for this foundation, but it disappointed me. No product went so bad on my skin. For some reason when applying the foundation it emphasizes all the flaws and wrinkles. Purchased this foundation after seeing the reviews and all the advertising of it. I was told it was great for my skin type because it has a semi matte finish. I must say that I am extremely disappointed, I have oily combination skin and this foundation is not the one for my skin type. I applied the foundation with a beauty blender, at first it gives a nice coverage with a smooth finish however after a few hours of wear I noticed that my skin became oily - especially around my t-zone, my nose and mouth, the foundation was leaving patches and started to slide off my skin (bearing in mind I used it during the winter time, I don't want to think about wearing the foundation in warm weather). I have not used the foundation since and sadly it will go to waste. One of the best foundations! After using MAC foundations for a few years, I found that no matter which one I tried it would oxidise. I've always been a fan of Charlotte Tilbury and I think this was one of the first products I bought, and I'm glad I did. Leaves a beautiful finish to the skin, the coverage is easily buildable and is great for all skin types. I have more oily skin, with the odd dry patch, and it will last throughout the whole day and still looks good. Most definitely worth a buy! Not forgetting the colour match was perfect. As many people I have combination skin - dry patches near the jawline and an oily t-zone. First applied, this foundation gave a reasonable amount of coverage but definitely wouldn't call it full coverage. The foundation instantly makes your face feel soft and moisturized, so doesn't feel heavy at all. After a few hours wear the foundation weirdly begins to separate on the skin leaving notable blotches on your face. I tried this with a variety of primers, powders and setting sprays but nothing worked. Sadly won't be repurchasing.